Parents, Are YOU Equipped To Speak To Your Child About Salvation? If your child expresses a desire to become a Christian, are you prepared? Are you confident that you can tell if he/she is ready for baptism? Being a parent can be the most difficult job in the world. We want to be the best parent we can be and we strive to make the right choices, especially where our children are concerned. Making the decision to accept Christ as Lord and Savior is the biggest pronouncement a person will ever make. As Christian parents, we want nothing more than for our child to have an intimate relationship with Jesus. Is your child knowledgeable enough about God’s plan of salvation to make a well-informed decision to accept Jesus? As Christians, we are committed to our doctrinal values but do we know “why” we believe the way we do? Do we know what scriptures support our viewpoints? Are we confident that we can explain our beliefs to our child in a way that he/she can comprehend? You don’t have to be a Bible scholar or educator to teach your child about God’s plan of salvation. It is important though to explain the concepts in such a way that your child can grasp and appreciate the process. 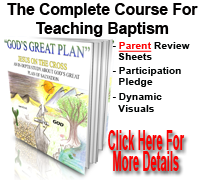 The “God’s Great Plan” course is an organized, easy-to-follow guide for parents to use as they prepare their child for baptism. Over a period of (8) consecutive sessions he/she will learn about the origin of God and the beginning of mankind through the second coming of Christ and eternity. They will study Old and New Testament scriptures about sin, satan and temptation. He/she will hear about some of the laws of the Old Testament and why we do not live by them today. Jesus is portrayed as the ultimate sacrifice for the forgiveness of sins thus prompting us to respond to His gift of salvation. 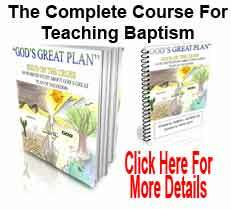 The course includes numerous scriptures about the purpose and method of baptism recorded in the New Testament. The series concludes with information about what happens after baptism and how we begin growing closer in our relationship with Christ. The study also includes assessment questions for a review of the entire study. It is my honor and conviction to use my spiritual gifts and abilities through the creating of this course to help you guide your child through this decision-making process. Joshua 24:15 - "As for me and my household, we will serve the Lord."